Rawene is a town on the south side of the Hokianga harbour, in Northland, New Zealand. State Highway 12 passes to the south. The town lies at the apex of a peninsula. A car ferry links it to Kohukohu and the northern Hokianga. The population was 438 in the 2006 Census, a decrease of 24 from 2001. 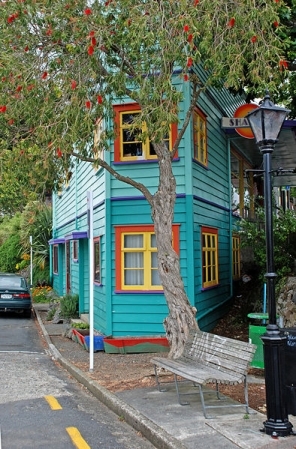 Rawene started as a timber centre, with a mill and shipyards established in the early 19th century. 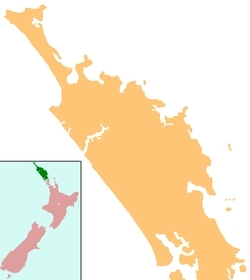 An attempted settlement by the first New Zealand Company in 1826 failed. Captain James Herd in 1822 had taken out the first shipment of kauri from the Hokianga in his ship Providence. In 1825 he returned as an agent for the company sailing the Rosanne in company with the Lampton, and 60 settlers between the two vessels. They began at Stewart Island/Rakiura and sailed up the east coast, leaving Lampton as a place name in Wellington, eventually rounding North Cape to enter Hokianga - his old stamping ground. Herd negotiated to buy a vast tract of land. The deal was contested but for decades Europeans referred to the town as "Herd's Point". Later it was called "Hokianga Township", and in 1884 it became "Rawene", possibly to identify the post office and telegraph. The post office was operating by 1845 - one of the eight in the country. Aperahama Taonui, chief of Te Popoto hapū, is said to have operated a school at Rawene in the mid-19th century. James Reddy Clendon, previously the United States Consul to New Zealand, settled in Rawene in 1862 and served as the local magistrate under the Native Circuit Courts Act until 1867. His house still stands and is open to the public. By 1872, there were two hotels in Rawene, and two stores. There was a Wesleyan church, and the Roman Catholics owned a section. Von Sturmer was the Postmaster, Customs Officer and Magistrate. During the Dog Tax War of 1898, Rawene was evacuated after the tax rebels threatened to march on the town. On 5 May 1898 120 men marched from Rawene to Waima to deal with the revolters, but the dispute was settled without them. A small cottage hospital was built on a hill overlooking the town in 1910. A new hospital was completed in 1928. Dr George McCall Smith headed the hospital from 1914 to 1948 and developed a unique health system for the Hokianga. Dr Smith became a practitioner of 'painless childbirth' in the early 1930s, using premedication with the barbiturate Nembutal combined with hyosine. This proved very popular and attracted women to Rawene from far afield. The annual average of thirty births per year now peaked at two hundred. In 1937 a 'Commission of Inquiry into Rural Maternity Services' was established with Smith's practice as its primary concern. Smith fronted up with case notes on his last two hundred patients, and his results could not be bettered anywhere. The area was declared a special health area in the 1940s. This meant that all medical officers in the Hokianga were salaried, and all consultations, pharmaceuticals, investigations and hospital admissions were free. The whole scheme was funded through a per capita grant. Rawene School is a coeducational full primary (years 1-8) school with a decile rating of 2 and a roll of 80. The Rawene Learning Centre is a campus of NorthTec. A room for secondary students was added to Rawene Primary School in 1922. In 1947 a stand-alone Rawene District High School was built. It was extended in 1952, but was destroyed by fire in 1972. * Norm Maxwell, rugby union footballer and All Black. Opononi Area School is a coeducational composite (years 1-15) school with a decile rating of 2 and a roll of 269. This page was retrieved and condensed from (http://en.wikipedia.org/wiki/Rawene) see Wikipedia, the free encyclopedia, January 2009.